Download "Cheers? 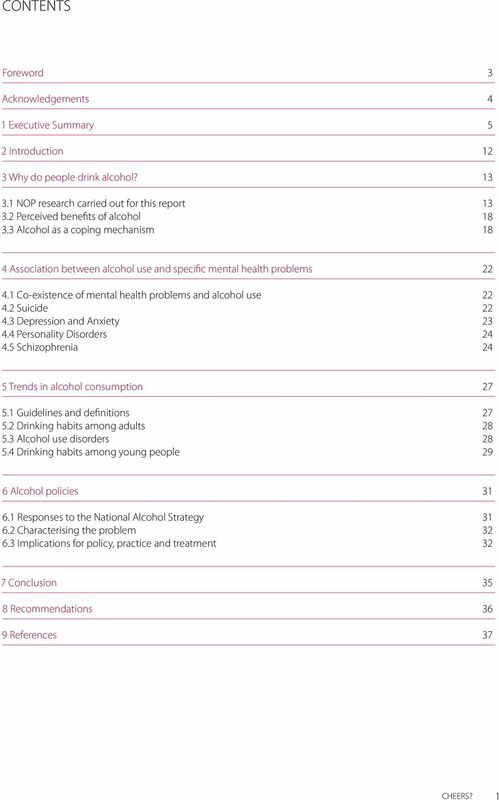 Understanding the relationship between alcohol and mental health"
2 CONTENTS Foreword Acknowledgements 1 Executive Summary 2 Introduction 3 Why do people drink alcohol? 3.1 NOP research carried out for this report 3.2 Perceived benefits of alcohol 3.3 Alcohol as a coping mechanism Association between alcohol use and specific mental health problems 4.1 Co-existence of mental health problems and alcohol use 4.2 Suicide 4.3 Depression and Anxiety 4.4 Personality Disorders 4.5 Schizophrenia Trends in alcohol consumption 5.1 Guidelines and definitions 5.2 Drinking habits among adults 5.3 Alcohol use disorders 5.4 Drinking habits among young people Alcohol policies 6.1 Responses to the National Alcohol Strategy 6.2 Characterising the problem 6.3 Implications for policy, practice and treatment Conclusion 8 Recommendations 9 References CHEERS? 3 While much debate has taken place recently about alcohol, we have failed to draw out the reasons why so many people have troubled relationships with it. 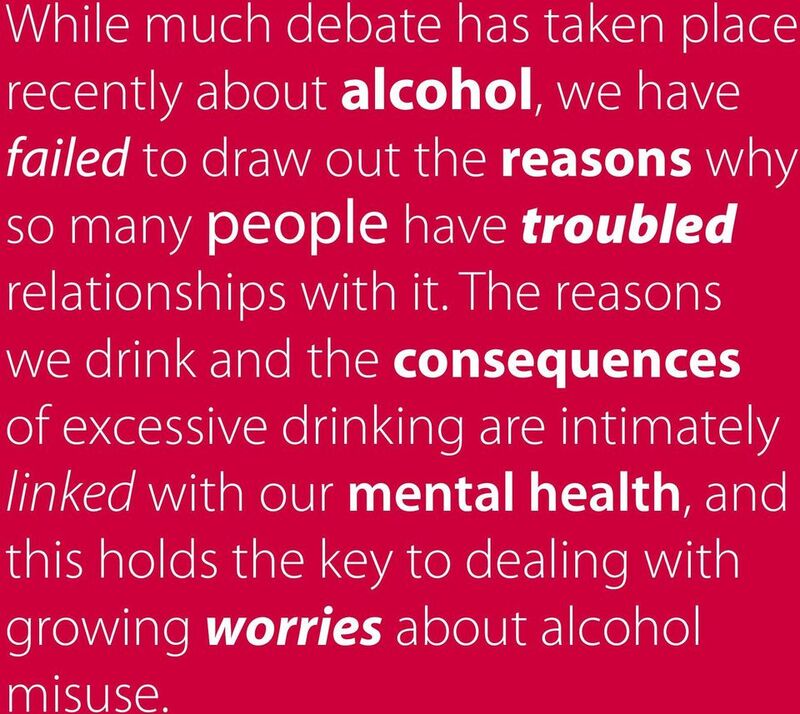 The reasons we drink and the consequences of excessive drinking are intimately linked with our mental health, and this holds the key to dealing with growing worries about alcohol misuse. 2 CHEERS? 5 Acknowledgements This report was written by Dr Deborah Cornah, an independent consultant. Face-to-face interviews were conducted by Jo Sherlock, an independent researcher. It was commissioned and edited by Celia Richardson, Director of Communications at the Mental Health Foundation, with research and policy direction from Iain Ryrie, Research Director and Dr Andrew McCulloch, Chief Executive of the Mental Health Foundation. We would like to thank all of the people who shared their stories with us for the report. Their names and some of their personal details have been changed. 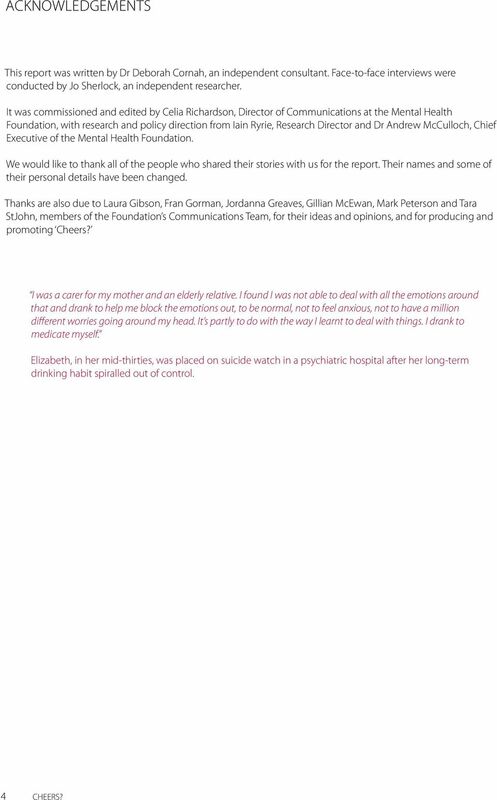 Thanks are also due to Laura Gibson, Fran Gorman, Jordanna Greaves, Gillian McEwan, Mark Peterson and Tara StJohn, members of the Foundation s Communications Team, for their ideas and opinions, and for producing and promoting Cheers? I was a carer for my mother and an elderly relative. I found I was not able to deal with all the emotions around that and drank to help me block the emotions out, to be normal, not to feel anxious, not to have a million different worries going around my head. It s partly to do with the way I learnt to deal with things. I drank to medicate myself. Elizabeth, in her mid-thirties, was placed on suicide watch in a psychiatric hospital after her long-term drinking habit spiralled out of control. 4 CHEERS? 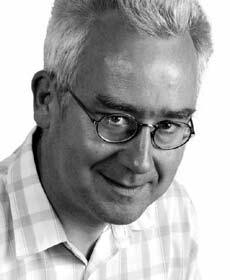 7 Executive Summary Mood, mental health and alcohol Self-medication is not a concept that can only be applied to people with diagnosed mental health problems, and is in fact a useful way to describe many of the reasons we drink. Little has been said in public policy documents about the way the general population relies on alcohol a legally available drug as a mood-altering substance that is used to mask other problems, or to deal with emotions. Alcohol is a toxic substance in terms of its direct and indirect effects on the chemistry of the brain and other body organs and systems. The initial impact of a drink that winding down or relaxing feeling is a reflection of almost immediate chemical changes occurring in the brain s nerve cells (neurons) in response to alcohol. As more alcohol is consumed, increasingly sensitive parts of the brain become affected and behaviour changes accordingly. The first drink for many people (although not all) depresses the parts of the brain that are associated with inhibition, increasing talking and self-confidence and reducing social anxiety. As more alcohol enters the bloodstream, the areas of the brain associated with emotions and movement are affected, often resulting in exaggerated states of emotion (anger, withdrawal, depression or aggressiveness) and uncoordinated muscle movements. Alcohol then depresses the nerve centres in the area that controls sexual arousal (which increases) and performance (which doesn t). Drinking to relieve anxiety and depression There is much evidence to show that many people drink to help deal with anxiety and depressive thoughts. It reveals that alcohol can be a favourite coping mechanism. When the results of a recent survey were extrapolated to the general population, researchers found that up to 12 million adults in the UK drink to help them relax or overcome feelings of depression. There are two potential problems in using this coping mechanism. Firstly, self-medicating with alcohol can become self-perpetuating. Underlying anxiety leads to increased alcohol use, which changes the physiology of the brain and leads to a depletion of the neurotransmitters (the brain s messengers ) that it needs to reduce anxiety naturally. Therefore, the individual feels more anxious and needs more alcohol to numb their anxiety. In the long term, this can lead to an individual becoming tolerant of alcohol that is, they need increasingly large amounts of drink to experience the same reduction in their anxiety. The second problem with using alcohol to self-medicate is that it is difficult to maintain exactly the amount of alcohol needed to reduce the negative feelings. Keeping the optimum balance of alcohol to reduce anxiety is almost impossible because the effect of alcohol on the brain is such that after the initial euphoria or stimulation from the first drink, alcohol acts as a depressant and the feelings of anxiety may rapidly return. Increased drinking to cope with those feelings leads to a rapid increase in the levels of alcohol in the blood and may become counter-productive. 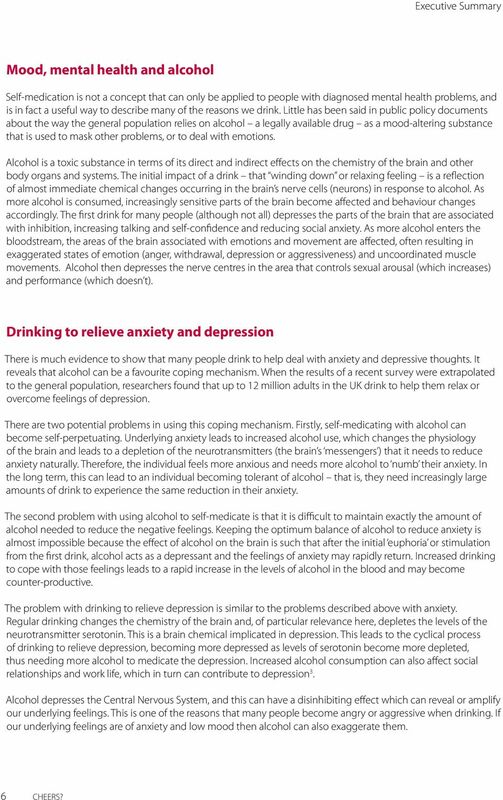 The problem with drinking to relieve depression is similar to the problems described above with anxiety. Regular drinking changes the chemistry of the brain and, of particular relevance here, depletes the levels of the neurotransmitter serotonin. This is a brain chemical implicated in depression. This leads to the cyclical process of drinking to relieve depression, becoming more depressed as levels of serotonin become more depleted, thus needing more alcohol to medicate the depression. Increased alcohol consumption can also affect social relationships and work life, which in turn can contribute to depression 3. Alcohol depresses the Central Nervous System, and this can have a disinhibiting effect which can reveal or amplify our underlying feelings. This is one of the reasons that many people become angry or aggressive when drinking. If our underlying feelings are of anxiety and low mood then alcohol can also exaggerate them. 6 CHEERS? 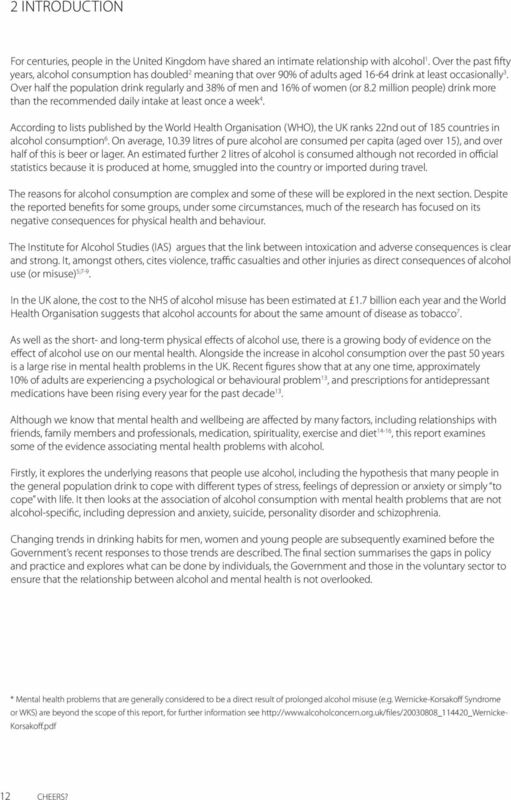 9 Executive Summary The Government s public health White Paper Choosing Health made encouraging and supporting sensible drinking one of its six overarching priorities along with smoking, diet, exercise, sexual health and mental heath. 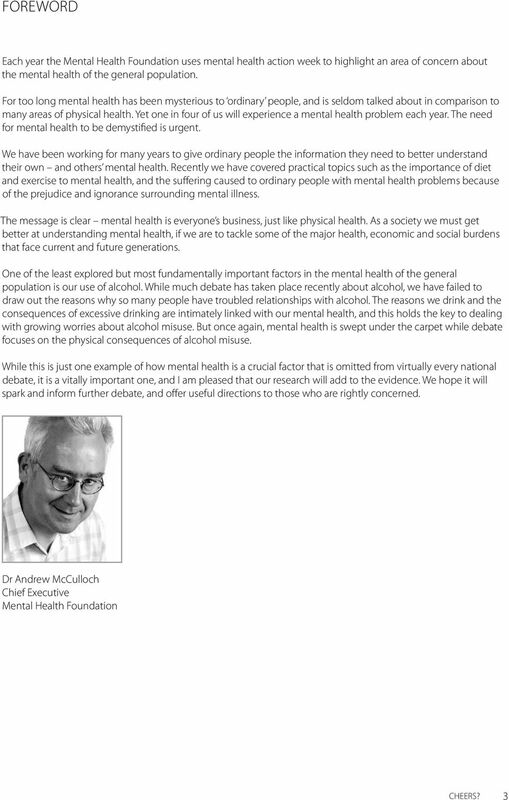 Because of the close link between alcohol and mental Health, it would not be advisable for the Government to formulate any further policy or guidance on drinking without serious exploration of the mental and emotional health causes and effects. 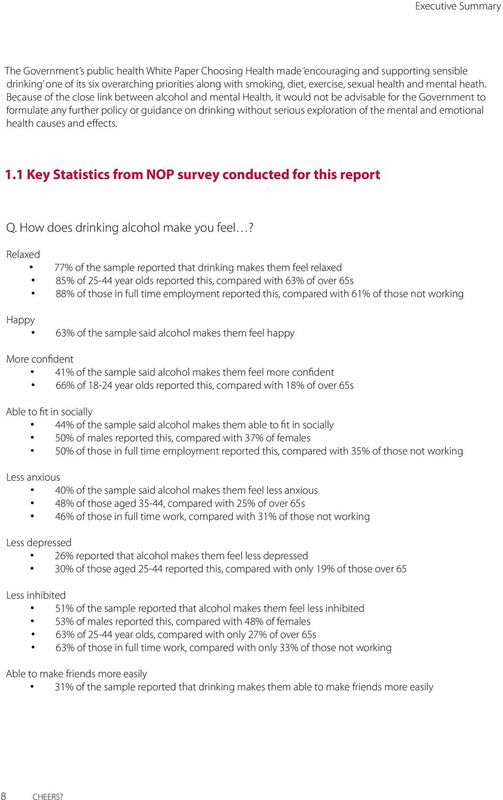 1.1 Key Statistics from NOP survey conducted for this report Q. How does drinking alcohol make you feel? Relaxed Happy 77% of the sample reported that drinking makes them feel relaxed 85% of year olds reported this, compared with 63% of over 65s 88% of those in full time employment reported this, compared with 61% of those not working 63% of the sample said alcohol makes them feel happy More confident 41% of the sample said alcohol makes them feel more confident 66% of year olds reported this, compared with 18% of over 65s Able to fit in socially Less anxious 44% of the sample said alcohol makes them able to fit in socially 50% of males reported this, compared with 37% of females 50% of those in full time employment reported this, compared with 35% of those not working 40% of the sample said alcohol makes them feel less anxious 48% of those aged 35-44, compared with 25% of over 65s 46% of those in full time work, compared with 31% of those not working Less depressed 26% reported that alcohol makes them feel less depressed 30% of those aged reported this, compared with only 19% of those over 65 Less inhibited 51% of the sample reported that alcohol makes them feel less inhibited 53% of males reported this, compared with 48% of females 63% of year olds, compared with only 27% of over 65s 63% of those in full time work, compared with only 33% of those not working Able to make friends more easily 31% of the sample reported that drinking makes them able to make friends more easily 8 CHEERS? 11 Executive Summary Young people in the UK drink more than nearly all the other countries in Europe 89. In 2004, just under a quarter of year olds drank alcohol in the last week 88 and the proportions rise sharply with age. 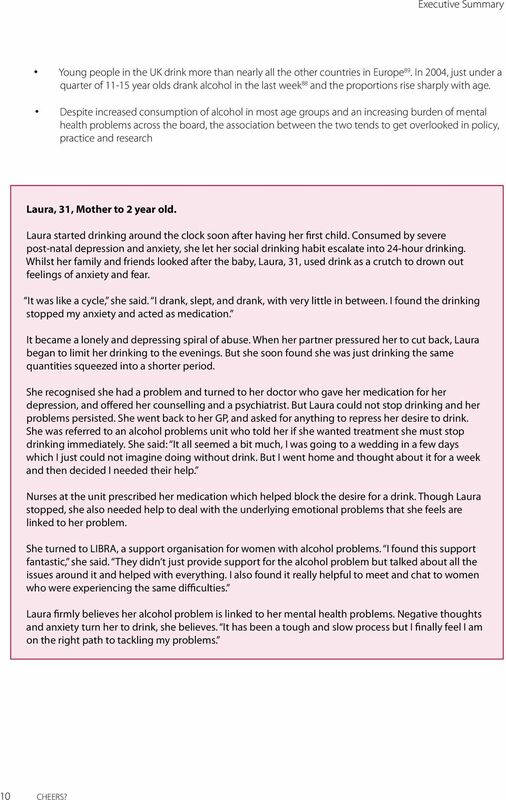 Despite increased consumption of alcohol in most age groups and an increasing burden of mental health problems across the board, the association between the two tends to get overlooked in policy, practice and research Laura, 31, Mother to 2 year old. Laura started drinking around the clock soon after having her first child. Consumed by severe post-natal depression and anxiety, she let her social drinking habit escalate into 24-hour drinking. Whilst her family and friends looked after the baby, Laura, 31, used drink as a crutch to drown out feelings of anxiety and fear. It was like a cycle, she said. I drank, slept, and drank, with very little in between. I found the drinking stopped my anxiety and acted as medication. It became a lonely and depressing spiral of abuse. When her partner pressured her to cut back, Laura began to limit her drinking to the evenings. But she soon found she was just drinking the same quantities squeezed into a shorter period. She recognised she had a problem and turned to her doctor who gave her medication for her depression, and offered her counselling and a psychiatrist. But Laura could not stop drinking and her problems persisted. She went back to her GP, and asked for anything to repress her desire to drink. She was referred to an alcohol problems unit who told her if she wanted treatment she must stop drinking immediately. She said: It all seemed a bit much, I was going to a wedding in a few days which I just could not imagine doing without drink. But I went home and thought about it for a week and then decided I needed their help. Nurses at the unit prescribed her medication which helped block the desire for a drink. Though Laura stopped, she also needed help to deal with the underlying emotional problems that she feels are linked to her problem. She turned to LIBRA, a support organisation for women with alcohol problems. I found this support fantastic, she said. They didn t just provide support for the alcohol problem but talked about all the issues around it and helped with everything. I also found it really helpful to meet and chat to women who were experiencing the same difficulties. Laura firmly believes her alcohol problem is linked to her mental health problems. Negative thoughts and anxiety turn her to drink, she believes. It has been a tough and slow process but I finally feel I am on the right path to tackling my problems. 10 CHEERS? 13 2 INTRODUCTION For centuries, people in the United Kingdom have shared an intimate relationship with alcohol 1. Over the past fifty years, alcohol consumption has doubled 2 meaning that over 90% of adults aged drink at least occasionally 3. Over half the population drink regularly and 38% of men and 16% of women (or 8.2 million people) drink more than the recommended daily intake at least once a week 4. According to lists published by the World Health Organisation (WHO), the UK ranks 22nd out of 185 countries in alcohol consumption 6. On average, litres of pure alcohol are consumed per capita (aged over 15), and over half of this is beer or lager. 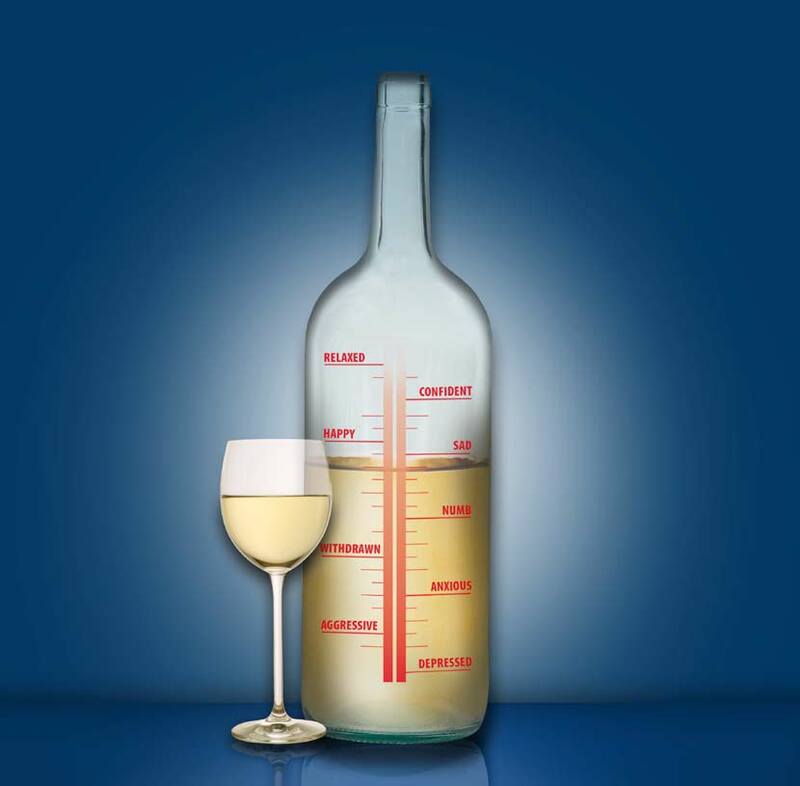 An estimated further 2 litres of alcohol is consumed although not recorded in official statistics because it is produced at home, smuggled into the country or imported during travel. The reasons for alcohol consumption are complex and some of these will be explored in the next section. Despite the reported benefits for some groups, under some circumstances, much of the research has focused on its negative consequences for physical health and behaviour. The Institute for Alcohol Studies (IAS) argues that the link between intoxication and adverse consequences is clear and strong. It, amongst others, cites violence, traffic casualties and other injuries as direct consequences of alcohol use (or misuse) 5;7-9. In the UK alone, the cost to the NHS of alcohol misuse has been estimated at 1.7 billion each year and the World Health Organisation suggests that alcohol accounts for about the same amount of disease as tobacco 7. As well as the short- and long-term physical effects of alcohol use, there is a growing body of evidence on the effect of alcohol use on our mental health. Alongside the increase in alcohol consumption over the past 50 years is a large rise in mental health problems in the UK. Recent figures show that at any one time, approximately 10% of adults are experiencing a psychological or behavioural problem 13, and prescriptions for antidepressant medications have been rising every year for the past decade 13. 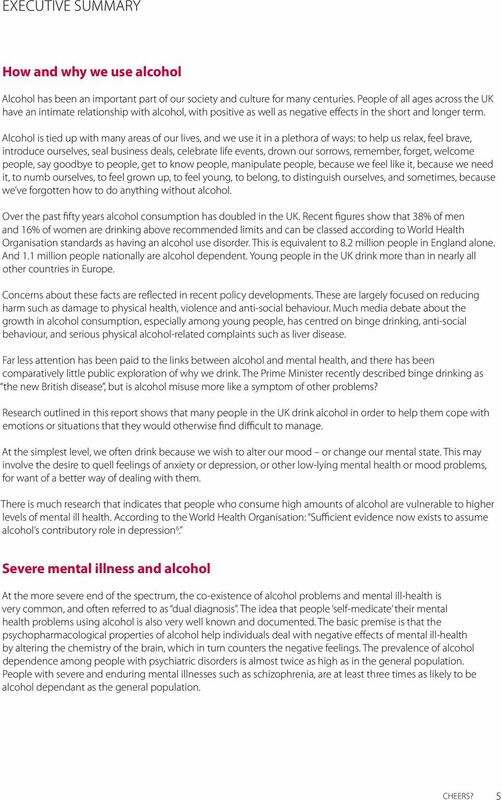 Although we know that mental health and wellbeing are affected by many factors, including relationships with friends, family members and professionals, medication, spirituality, exercise and diet 14-16, this report examines some of the evidence associating mental health problems with alcohol. 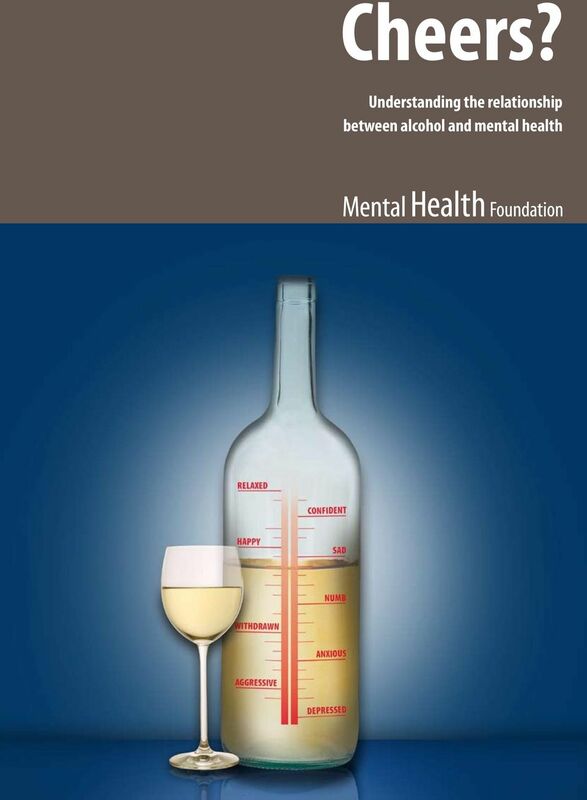 Firstly, it explores the underlying reasons that people use alcohol, including the hypothesis that many people in the general population drink to cope with different types of stress, feelings of depression or anxiety or simply to cope with life. 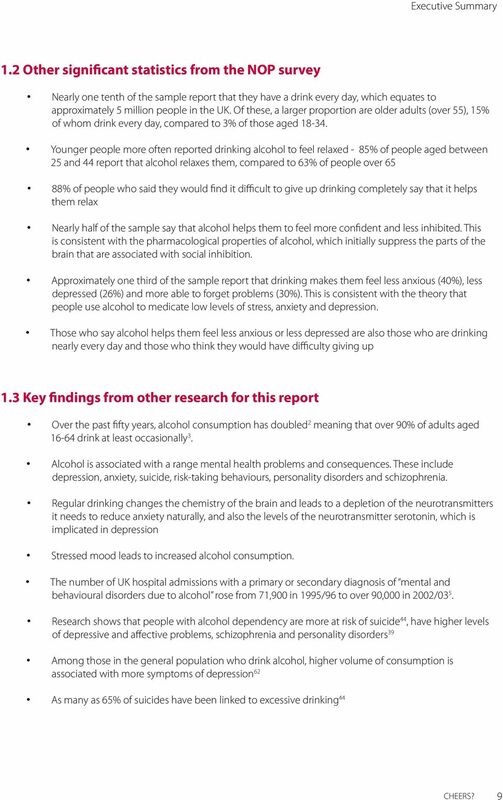 It then looks at the association of alcohol consumption with mental health problems that are not alcohol-specific, including depression and anxiety, suicide, personality disorder and schizophrenia. 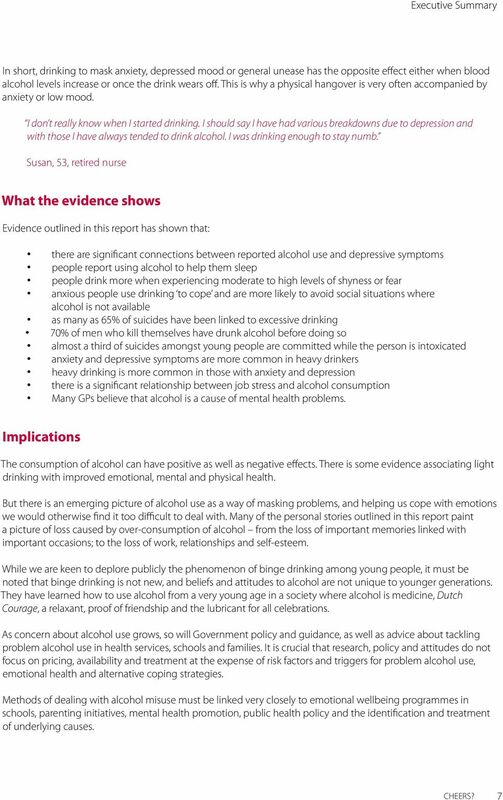 Changing trends in drinking habits for men, women and young people are subsequently examined before the Government s recent responses to those trends are described. 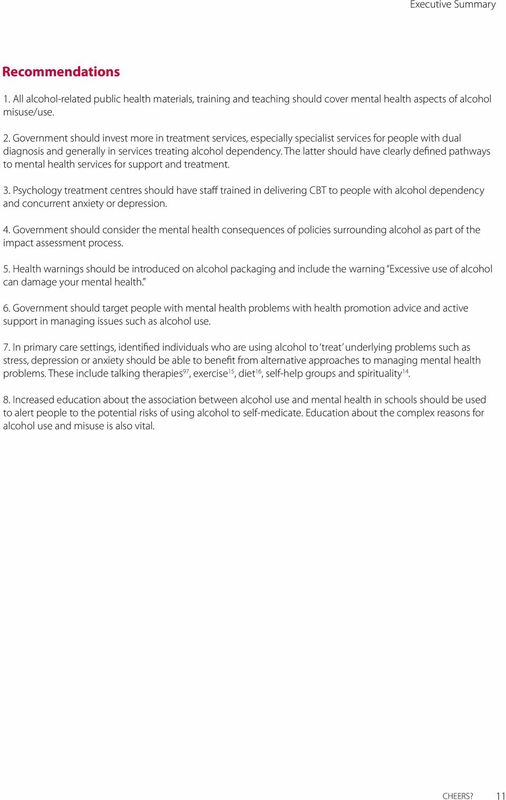 The final section summarises the gaps in policy and practice and explores what can be done by individuals, the Government and those in the voluntary sector to ensure that the relationship between alcohol and mental health is not overlooked. * Mental health problems that are generally considered to be a direct result of prolonged alcohol misuse (e.g. Wernicke-Korsakoff Syndrome or WKS) are beyond the scope of this report, for further information see Korsakoff.pdf 12 CHEERS? 15 Why do people drink alcohol? 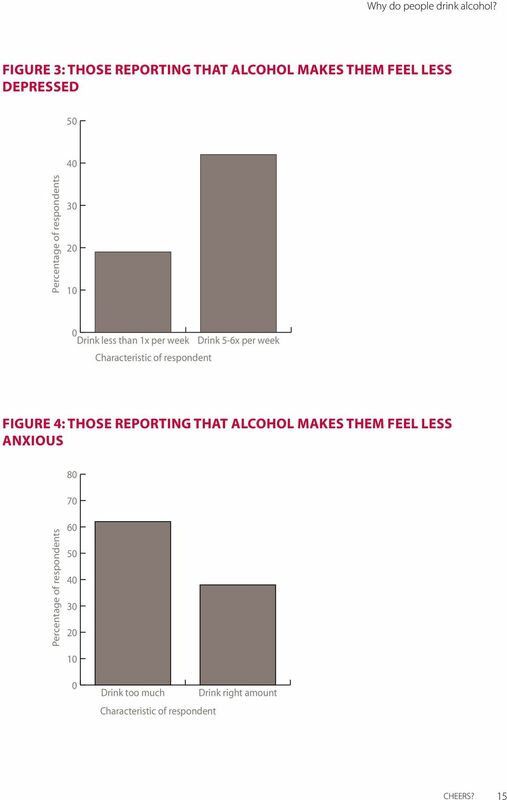 Figure 2: Characteristics of people reporting that alcohol makes them feel less inhibited yr old Over 65s Class AB Class DE Full time work Not working Drink 1x per wk Drink 5-6x per wk Drink too much Drink right amount Percentage of respondents Approximately one third of the sample report that drinking makes them feel less anxious (40%), less depressed (26%) and more able to forget problems (30%). This is consistent with the theory that people use alcohol to medicate low levels of stress, anxiety and depression. 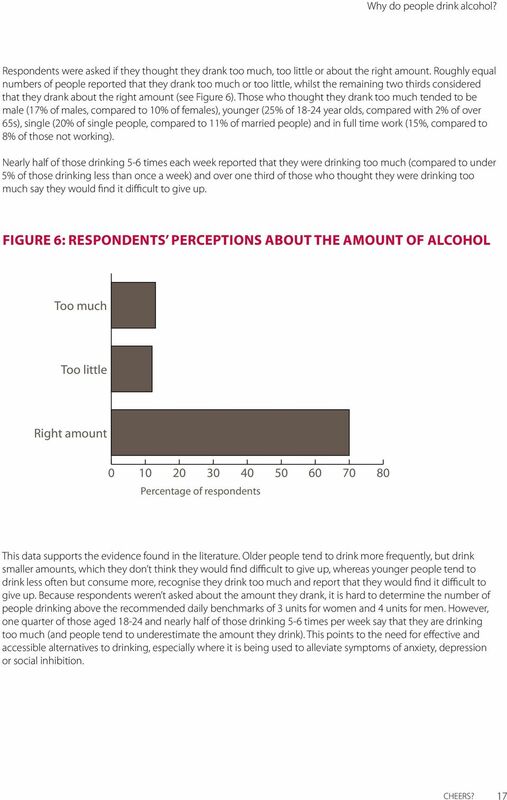 It is also consistent with the argument that using alcohol to self-medicate can lead to cyclical patterns of drinking those who report using alcohol to cope with anxiety and depression are those who are drinking nearly every day and also think they would have difficulty giving up (see Figures 3 & 4). 14 CHEERS? 17 Why do people drink alcohol? 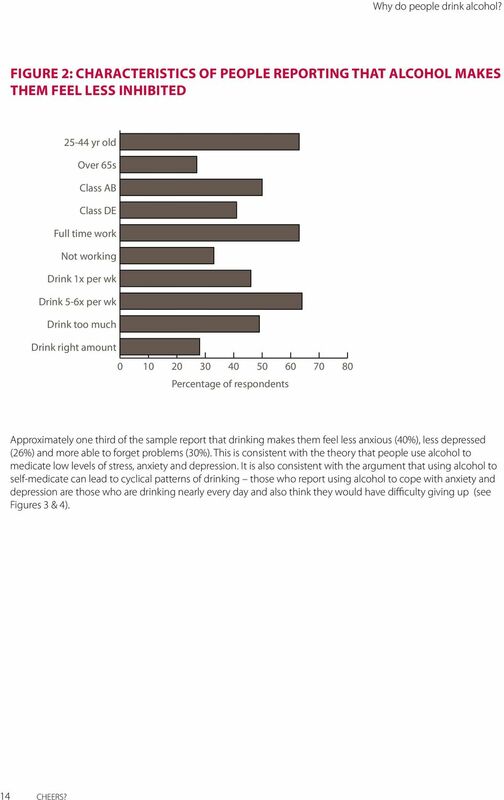 Drinking patterns in in the UK population Respondents to the NOP survey were asked how often they drank alcohol and the results are summarised in Figure 5. 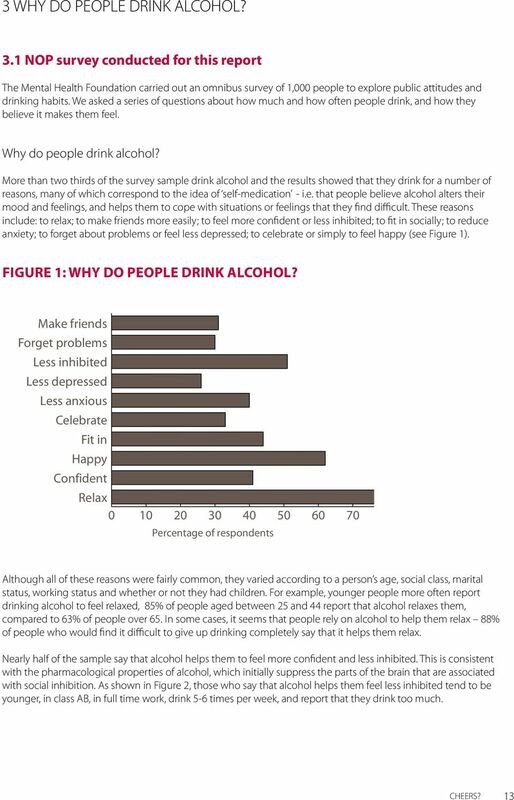 Just over a quarter of the sample reported that they did not drink alcohol at all, a higher percentage of whom were females (34%, compared to 22% of males) and those over 65 (45%, compared to 26% of those under 24). Of those who did drink, most people (65%) drink less than three times per week, and this is particularly true for females, those who are not working and those aged under 45. Conversely, nearly one tenth of the adult population report that they have a drink every day, which equates to approximately 5 million people in the UK. 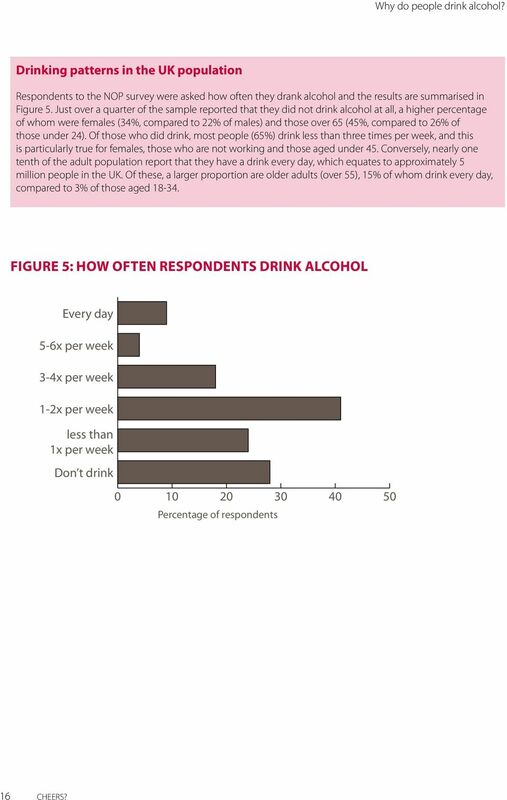 Of these, a larger proportion are older adults (over 55), 15% of whom drink every day, compared to 3% of those aged Figure 5: how often respondents drink alcohol Every day 5-6x per week 3-4x per week 1-2x per week less than 1x per week Don t drink Percentage of respondents 16 CHEERS? 19 Why do people drink alcohol? 3.2 Perceived benefits of alcohol Although many individuals in the UK may not report health benefits as the primary reason for enjoying a drink or two, there is some evidence associating light drinking (less than 7 units a week) with improved physical, emotional and mental health in some adults 17;18. Others, however, have argued that apparent instances of beneficial effects of alcohol most typically result from poorly conducted experiments and a lack of control for other influential factors such as pre-existing mental health status, income, age and/or educational level 19. Regardless of whether, when or why alcohol is beneficial, there are many other reasons why people drink. In the UK in particular, drinking alcohol is associated with a range of emotional situations throughout life, from births ( wetting the baby s head ) to weddings ( toasting the happy couple ) to funerals. It is also one of the nation s most powerful lubricants in social activities, as many of the nation s football, rugby or cricket fans would testify. Put simply, our use of alcohol is associated with times of emotion we drink when we feel sad; we drink when we feel happy. We drink when we feel lonely; we drink when we feel sociable. Recent research confirms this observation and takes the argument one step further that many adults in the UK drink alcohol in order to help them cope with emotions or situations that they would otherwise find difficult to manage Alcohol as a coping mechanism in the general population The Priory Group s survey of 2000 adults 20 found that one third of adults relied on drinking to get through Christmas a time that is traditionally considered to be one of goodwill and cheer. 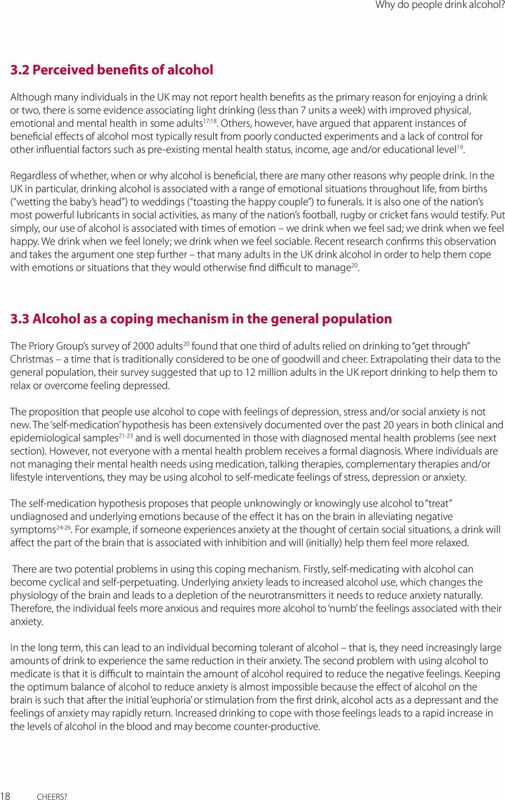 Extrapolating their data to the general population, their survey suggested that up to 12 million adults in the UK report drinking to help them to relax or overcome feeling depressed. The proposition that people use alcohol to cope with feelings of depression, stress and/or social anxiety is not new. The self-medication hypothesis has been extensively documented over the past 20 years in both clinical and epidemiological samples and is well documented in those with diagnosed mental health problems (see next section). However, not everyone with a mental health problem receives a formal diagnosis. Where individuals are not managing their mental health needs using medication, talking therapies, complementary therapies and/or lifestyle interventions, they may be using alcohol to self-medicate feelings of stress, depression or anxiety. 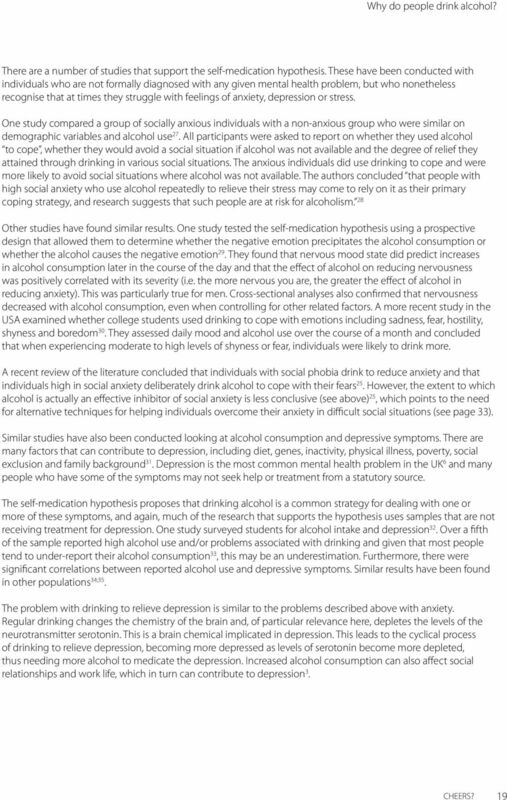 The self-medication hypothesis proposes that people unknowingly or knowingly use alcohol to treat undiagnosed and underlying emotions because of the effect it has on the brain in alleviating negative symptoms For example, if someone experiences anxiety at the thought of certain social situations, a drink will affect the part of the brain that is associated with inhibition and will (initially) help them feel more relaxed. There are two potential problems in using this coping mechanism. Firstly, self-medicating with alcohol can become cyclical and self-perpetuating. Underlying anxiety leads to increased alcohol use, which changes the physiology of the brain and leads to a depletion of the neurotransmitters it needs to reduce anxiety naturally. Therefore, the individual feels more anxious and requires more alcohol to numb the feelings associated with their anxiety. In the long term, this can lead to an individual becoming tolerant of alcohol that is, they need increasingly large amounts of drink to experience the same reduction in their anxiety. The second problem with using alcohol to medicate is that it is difficult to maintain the amount of alcohol required to reduce the negative feelings. Keeping the optimum balance of alcohol to reduce anxiety is almost impossible because the effect of alcohol on the brain is such that after the initial euphoria or stimulation from the first drink, alcohol acts as a depressant and the feelings of anxiety may rapidly return. Increased drinking to cope with those feelings leads to a rapid increase in the levels of alcohol in the blood and may become counter-productive. 18 CHEERS?